Typically known for fish and chips or bangers and mash, British fare is often regarded as a bit of an underdog in the world of international cuisine. But even the biggest food connoisseur would struggle to turn down a proper roast dinner. 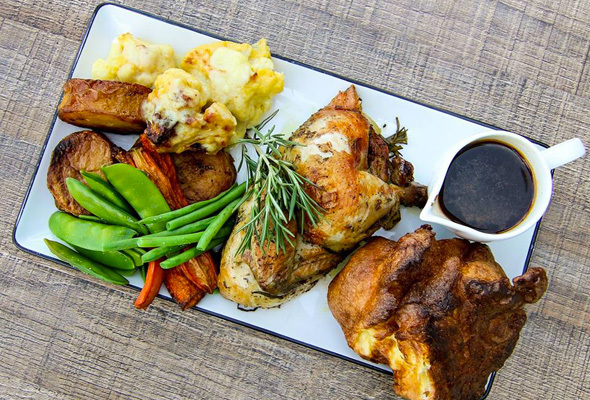 Here are 19 of our favourite roast dinners in Dubai – complete with all the trimmings, obviously. This Sports City restaurant proved so popular that it was forced to open a second branch in Dubai Marina. 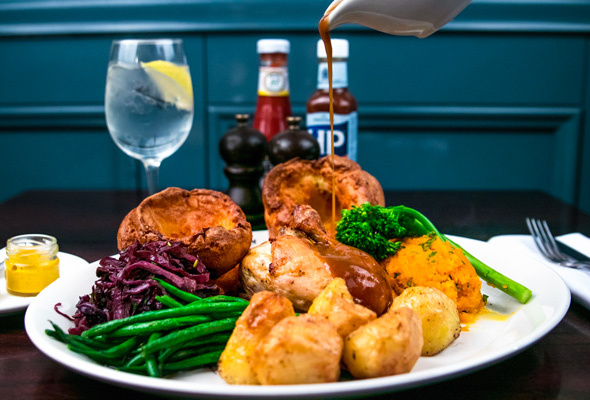 It does what it says on the tin – and serves up a minimal menu that’s all about the Sunday Roast, served with seasonal vegetables. 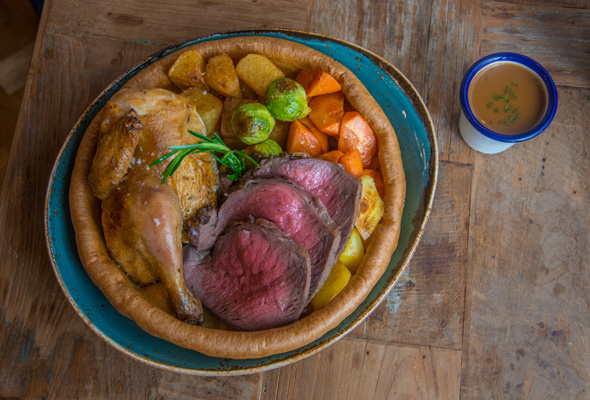 You can either order the regular roast or the Yorkshire pudding bowl, which is a roast dinner served up in a giant Yorkshire pudding. Best of all – it delivers. 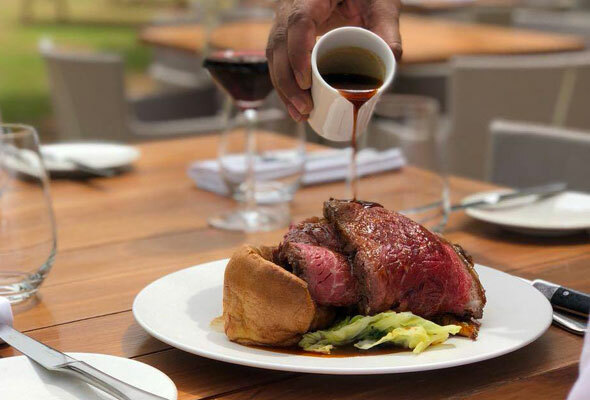 For a real home-away-from-home feeling, perennial Dubai favourite Lock, Stock & Barrel serves up its all-day roast every Saturday and Sunday alongside all the sporting action on the big screens. Enjoy two meats from a selection of beef, chicken or lamb with a complimentary drink included, plus happy hour runs from 4pm-8pm with buy one get one free on selected drinks. There’s a selection of offers to be had alongside Barrel 12’s Great British Roast, which costs Dhs99. This urban sports bistro offers it up alongside five bottled beers for Dhs199. 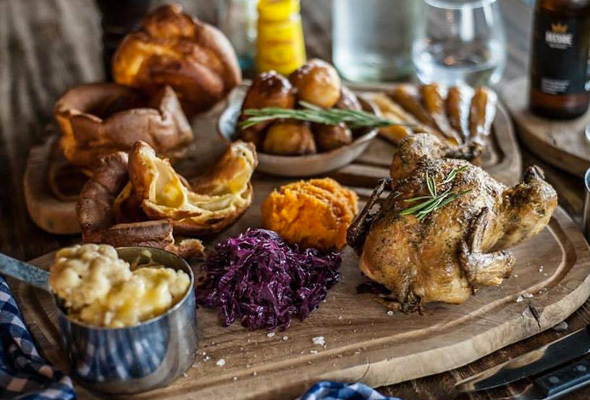 This family-friendly spot in The Lakes serves up a roast dinner every Saturday and Sunday. There’s a variety of meats on the menu (chicken is priced at Dhs100 while beef is Dhs124), and it’s served up with all the classic English trimmings and lashings of gravy. With views of the lake and a proper pub garden to be enjoyed in the cooler months, you could easily be mistaken for thinking you were in the UK. 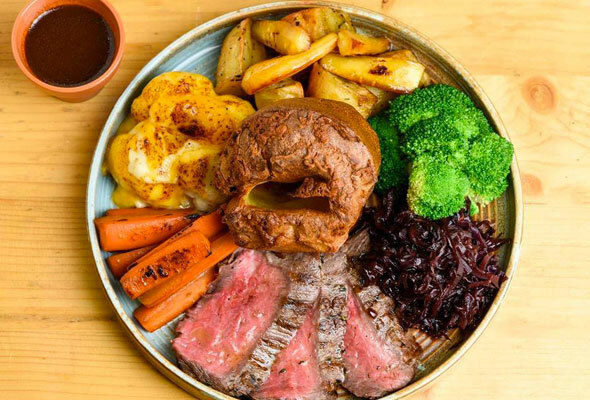 Formerly known as The Black Lion, Dubai’s leading chef duo Nick Alvis and Scott Price have moved in as the pub landlords, and they serve up a weekly roast every Saturday and Sunday at their renamed pub, The Lion by Nick and Scott. It’s priced at Dhs110 including a beer, and is designed to be served up alongside the weekend sports fixtures. Business Bay gastropub The Eloquent Elephant only serves up a roast on a Saturday from 3pm, so it’s an option for those after an evening roast, or opting for a late lunch. The meat changes weekly from chicken to beef to lamb, ranging from Dhs110 to Dhs125 depending on the meat. Casual Scottish pub Copper Dog is the kind of place you don’t need to glam up for, which is great for a weekend you just want to spend pigging out on a proper roast. Their offering, available from Friday to Sunday is priced at Dhs115, and it’s a choice of three meats with a selection of veg. They’re not our favourite trimmings, but it’s still a generous portion. Irish pub chain McGettigan’s serve up a weekly Saturday and Sunday roast at all their Dubai branches (that’s JLT, Souk Madinat and DWTC). Priced at Dhs119, the roast of the day is served up with all the traditional trimmings, as well as a house drink. Upgrade to a bottle of house wine for Dhs95, or add a starter or dessert for Dhs30. Where fine dining meets comfort food, you’ll find Marina Social. 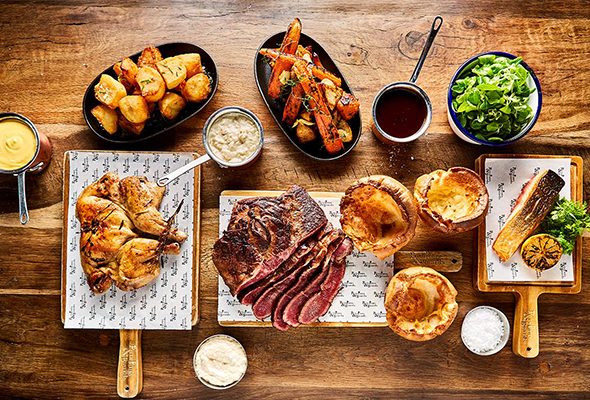 The restaurant by celebrity chef Jason Atherton in Dubai Marina serves up a lunch and dinner service of its traditional roast for Dhs120 per person. 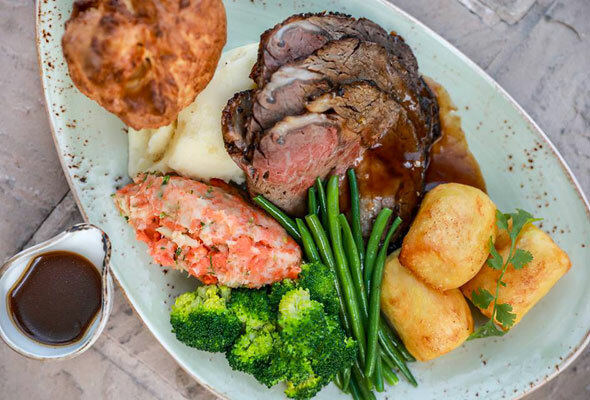 When it’s cooler, bag a table on the outdoor terrace and soak up the Dubai Marina views as well as every last mouthful of gravy-drenched Yorkshire pud. 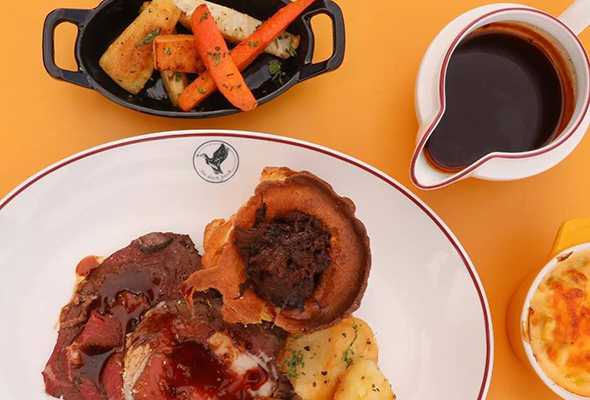 Bright and lively country pub, The Duck Hook, located at the 19th hole of Dubai Hills Golf Club, offers up a simple yet effective roast with sides for Dhs125. 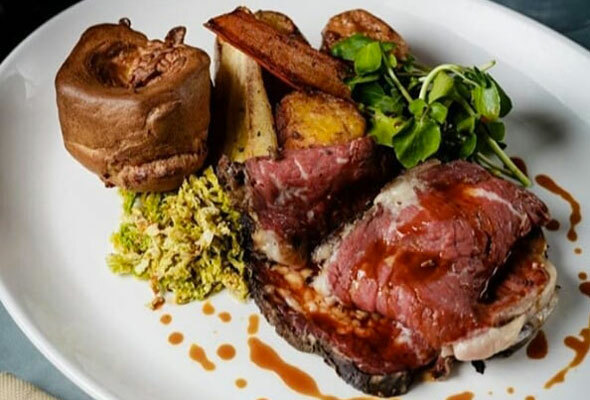 The beef is cooked three ways, slow-roasted topside, roasted rib and slow-cooked pulled short rib with thyme and honey roasted root vegetables. 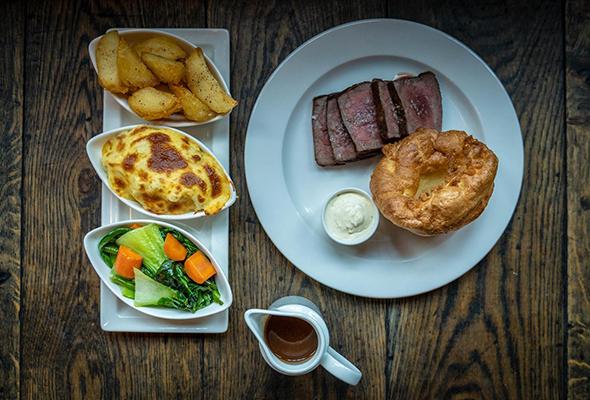 The accompaniments include duck fat roast potatoes, cauliflower and leek gratin, homemade Yorkshire puddings and lashings of gravy. 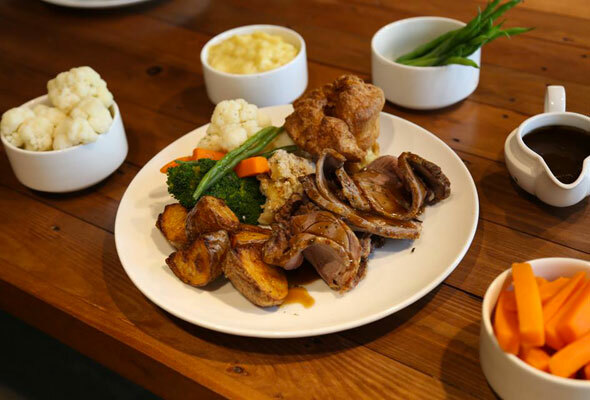 Dhow and Anchor, the contemporary gastro pub in Jumeirah Beach Hotel or D&A, as it’s fondly known, offers a daily ‘Roast of the Day’ which changes between lamb, beef and chicken. It’s a generous plate that comes with roasted root vegetables, Yorkshire pudding and a portion of mash and gravy to share. 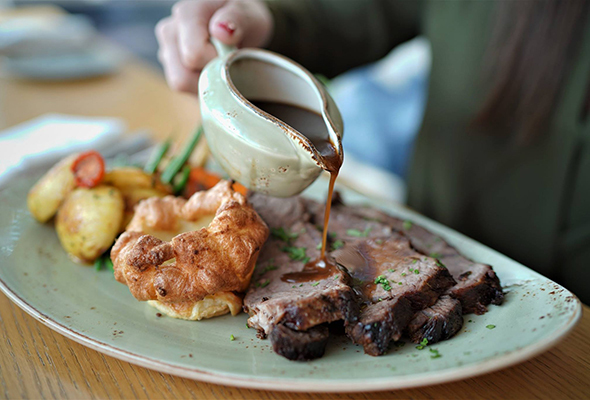 Stoke House, the family-friendly British pub at the Damac Hills Golf Course has a Sunday roast can be ordered as part of a family bundle. Prices start at Dhs65 for kids, Dhs125 for adults or Dhs195 per adult with a bottle of wine when a minimum of two are ordered. 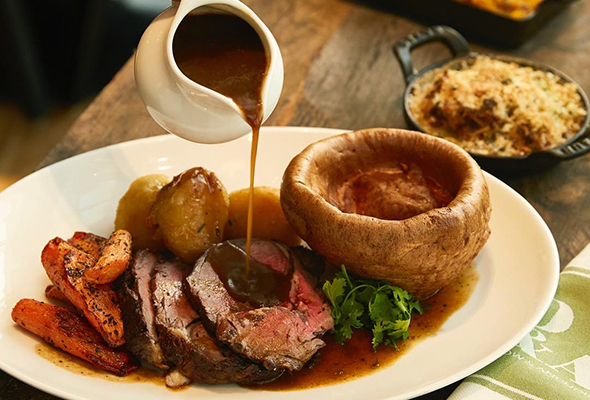 Celebrity chef Simon Rimmer’s popular British restaurant in Dubai Marina serves up an all-day roast every Friday, Saturday and Sunday. 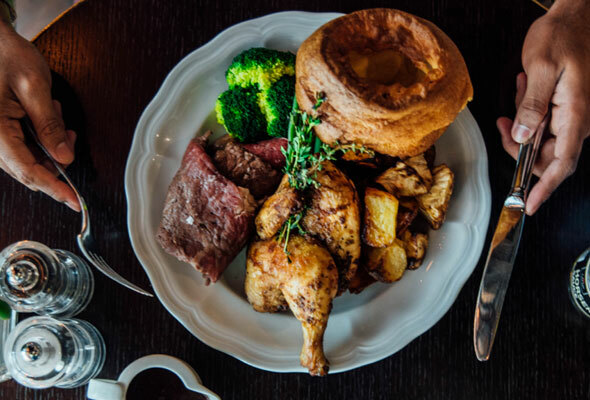 There’s lamb, beef, chicken or nutloaf for the veggies, and they’re all served up with seasonal vegetables and a giant Yorkshire pudding. There’s also the option to supersize for the extra-hungry, or add a bottle of wine for Dhs130. There’s a cosy feel to this British restaurant, with an outdoor terrace overlooking Dubai Marina which provides a great space for alfresco dining. 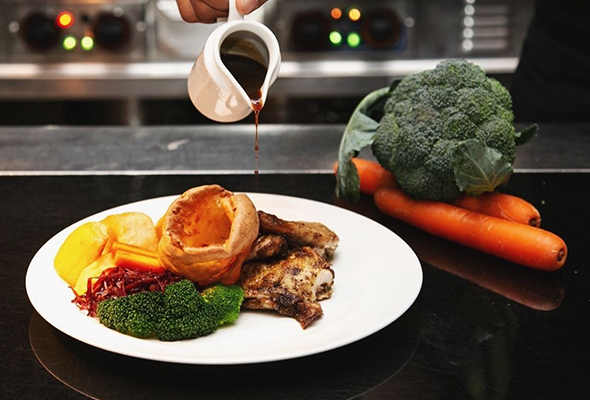 The weekly Saturday roast is priced at Dhs125 which comes as a generous serving, saving just enough room for a traditional British dessert. There’s no chance of missing the entrance of this British pub – it’s marked by a big red telephone box. 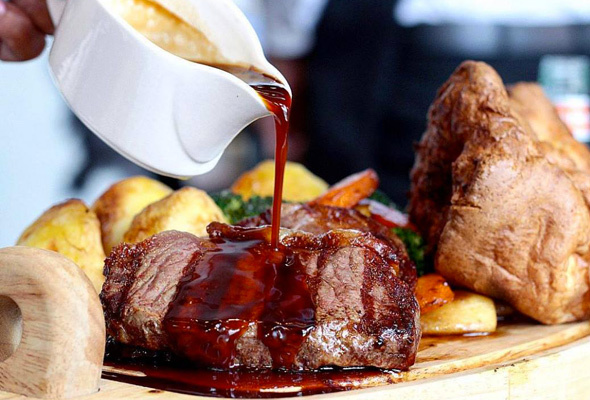 Every Saturday and Sunday, Rose & Crown offers up two roasts plus a bottle of wine for Dhs250 with their Roast & Toast deal. Pots, Pans & Boards is the first Dubai venture by Tom Aikens, who was only 26 – the youngest chef in the UK – when his restaurant received two Michelin stars. 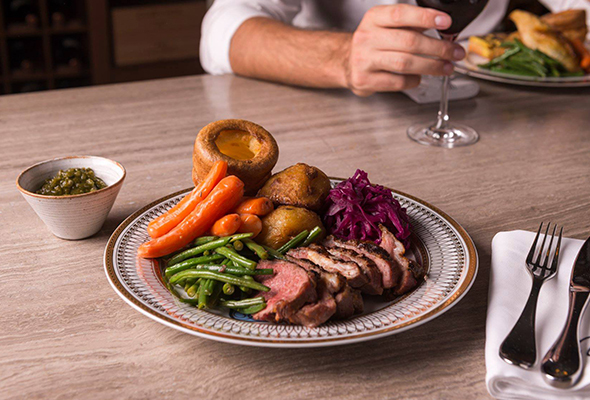 The unlicensed spot offers a roast dinner with either beef strip loin, half a chicken or salmon fillet with trimmings for Dhs134. The dinner is served every Friday and Saturday from 12pm to 4pm or on Sundays after 6pm. Gordon Ramsay’s Dubai outpost is one of the city’s most popular British restaurants. 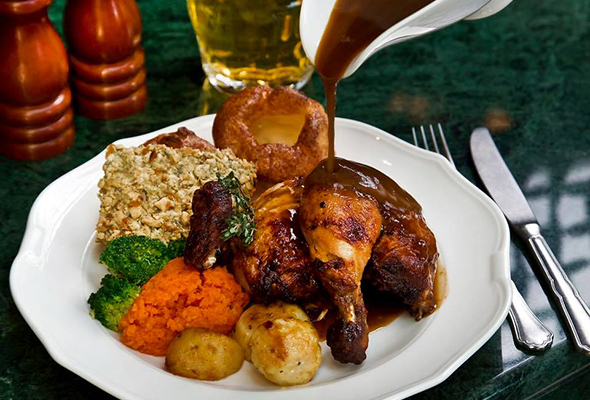 The roast is only available between 12pm to 4pm and is priced at Dhs135 per person. There’s an upscale Argentinian twist on the weekend roast at Gaucho Dubai. The vegetables might be typically traditional, but the cuts of meat on offer include sirloin, ribeye or whole spatchcock chicken. Upgrade to two courses and it’s Dhs270, or Dhs320 for three courses. There’s also a beverage package available for an extra Dhs210, which offers two hours of unlimited house drinks. For a more upscale affair, choose the Gaucho Asado (Dhs405) -perfect for sharing, it’s served with truffle scented chips, humita salteña, grilled tomatoes, portobello mushrooms, fried eggs and chimichurri.